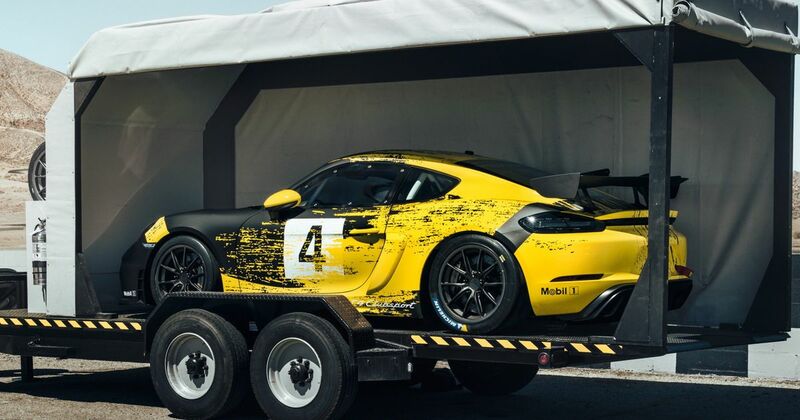 One of the worst-kept secrets in the car world currently is that Porsche is cooking up a 718 Cayman GT4 with a naturally-aspirated flat-six. And now, the Stuttgart-based firm has released something to make the incoming king of the 718 Cayman range even more obvious. 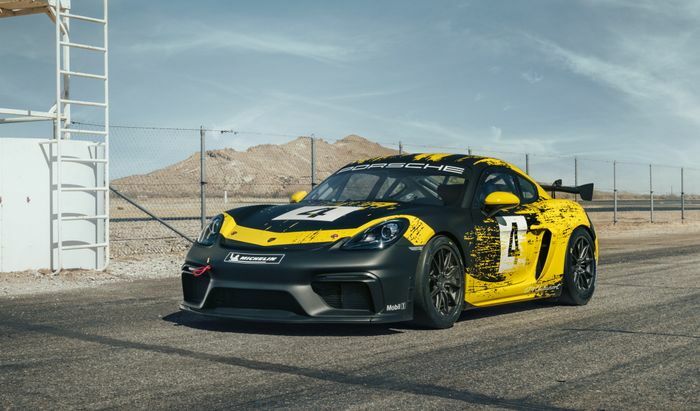 It’s the 718 Cayman GT4 Clubsport, a turn-key racing car that’s powered by - you guessed it - an N/A flat-six. It’s a 3.8-litre unit - an evolution of the 991.1 Carrera S engine that was also used in the original road-going Cayman GT4. It was rumoured for some time that the 718 Cayman GT4 would use a detuned version of the 4.0-litre flat-six from the 911 GT3. The arrival of the 3.8-litre-powered Clubsport doesn’t necessarily rule a 4.0-litre road car out, though: sticking with the same engine for the racer makes sense, as the car doesn’t have to be re-homologated for the FIA GT4 category. Regardless, it’s still a fine engine, putting out 425bhp, an increase of 40bhp. It revs to 7800rpm, sending its power to the rear wheels via a dual-clutch automatic gearbox and a mechanical limited-slip differential. Proceedings take a particularly intriguing turn when it comes to the body parts. Both doors and the rear wing are made from an “organic fibre mix” derived from “agricultural by-products such as flax or hemp fibres”. 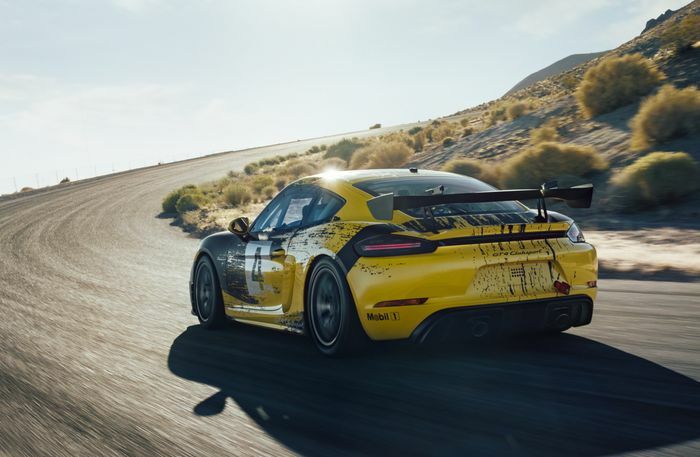 It’s the first production racer to have parts of its body made using a natural fibre composite, Porsche says, and the material is a lot like carbonfibre when it comes to weight and rigidity. Unlike the old one, it’s available in two different guises: ‘Trackday’ and ‘Competition’. The former comes with fixed-rate dampers and has its electronic aids (which can still be switched off) tuned to make the car a little friendlier at the limit. 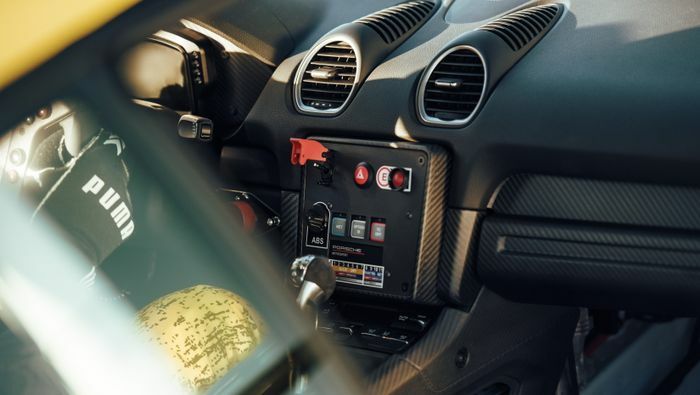 The Competition has three-stage adjustable dampers, an infinitely adjustable brake bias, an integrated air jack system, a 115-litre fuel tank, and a steering wheel pinched from the 911 GT3 R. If your race takes a turn for the worse, there’s an automatic fire extinguisher system. The Trackday Clubsport is yours for €134,000, and the Competition is €157,000 (you’ll need to add VAT on top of both of those prices). It’s available to order now in both guises, with deliveries taking place next month.